Dan and campers working on a new tune! 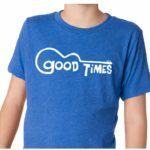 This week is our first ever “Rock Camp” for Good Times Guitar. We have 6 campers enjoying three hours of daily fun. We start by singing together at 9am (each day a different student leads the songs!). Then we all learn a new song that has easy chords for beginners but challenging riffs for the more advanced. 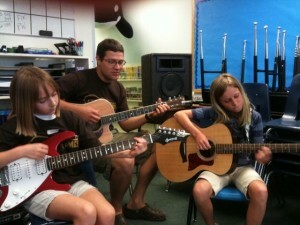 Students get some time to practice and then we have contests to see which rock camper learned the song the best! After a short recess, we come back and learn another riff-based rocker followed by yet another guitar competition! We are having so much fun! We conclude our day with an “open mic” time where students can share any song they’d like in front of a captive audience. We wrap up at noon and prepare for another 3 hours of rocking fun the next day! It’s not too late to sign up for Session #2 of Rock Camp, July 20-24. Click HERE.